Drug regulator under fire over herbal supplement company’s claims: “The science has disproven that this herb works,” Ken Harvey, a professor of public health and preventive medicine at Monash said. “Surely it’s crazy for the administration to allow them to advertise this product with no disclaimer. But for me, this is becoming typical … It’s another example of them being very helpful to industry while being ineffective from a consumer protection point of view. A TGA spokesperson said the herbal supplement was approved because [sufferers] MIGHT WISH TO TRY such a product for symptomatic relief (emphasis added). “The approved representations can help facilitate that choice while also providing advice to the consumer on when it is time to see a health professional,” she said. The Consumers Health Forum has urged the government to require labels on these complementary medicines to state whether or not their efficacy is medically proven. At the moment the administration’s approval process lends a false veneer of efficacy to these products in the eyes of many consumers. People don’t know how supplements can interact with medications. 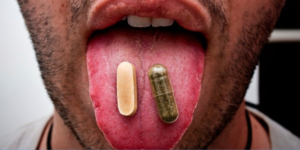 The ingredients in supplements can be highly variable. Some supplements contain ingredients not listed on the label. The worst offenders are in the third category, targetting some basic human desires: physical enhancement, weight loss, and sexual performance. These people are highly motivated to improve and therefore vulnerable to exploitation. So, if a supplement’s claims sound too good to be true, it’s because they aren’t true. Relax, You Don’t Need to ‘Eat Clean’: By fretting about food, we turn occasions for comfort and joy into sources of fear and anxiety. And when we avoid certain foods, we usually compensate by consuming too much of others. Finally, unproven stem cell clinic practices might be curtailed: Advertising their services online and in social media, the clinics use claims of efficacy and expertise to lure patients. But they offer little, if any, scientific proof their treatments work, and charge patients exorbitant fees for their services. How is it these clinics have been able to flourish in Australia and provide unproven, expensive and potentially risky treatments to such a wide group of potential patients? They have been able to exploit a loophole in TGA regulations that permits doctors to “transplant” a patient’s own tissue back into their body, without that tissue having been subjected to ordinary controls and standards that apply to the transplantation of biological tissue products. Stanley Dudrick: Total Parenteral Nutrition: A medical necessity for millions of patients (especially many severely premature infants) for whom it is unsafe to have oral food due to gut injury or underdevelopment, TPN provides the nutritional requirements for life via IV and is estimated to have saved over 10 million lives. Explainer: why do we get fungal nail infections and how can we treat them? About 10% of us (including 20% of people over 60 and 50% of people over 70) suffer from fungal nail infections. So why do we get them, and does it matter? Gene therapy and grafts regrow skin of boy with incurable skin-peeling disease: We can use new techniques like gene therapy to manage genetic diseases. Epidermolysis Bullosa (EB) refers to a group of skin blistering conditions – they can range from mild to severe, and patients with genetic forms may live most of their life almost entirely covered by bandages. The gene therapy used here involved taking a portion of skin from the patient and inserting back the missing gene. The skin was then grown in the lab before grafting onto severely affected areas on the patient. These kinds of therapies are truly amazing and combine recent advances in tissue culture and grafting with genetic technology. Let’s hope this technique is successful in more forms of EB. Discernment: The American Chiropractic Association Answers Crislip’s Call, Joins the Choosing Wisely Campaign: A good way to measure to the standards of an organisation or or group is to look for things that they reject. A group with very low standards will have very few thing that they reject, a group with high standards will have more things (of higher quality) that were simply not good enough. Further, this is also a good way to see how honest a group is about their standards. If a group claims to have high standards yet has very few things that they have rejected, or only reject things they dislike ideologically, it is highly probable that they do not apply their standards fairly or honestly. To this end the “Choosing Wisely” campaign seeks to ask different fields which treatments should be avoided, driving towards continued improvement across medicine in general, and chiropractors have been challenged to participate. Instead of identifying treatments that lack evidence or that compare poorly to other more effective options, the ACA stated that excessive imaging (X-rays), excessive back braces should be avoided, and that treatment plans and psycho social screening (for pain management) should be used. Avoiding x-rays is good, but the ACA has missed the point. All they had to do was target treatment decisions, saying “these 5 are our worst, we have better” They couldn’t do that because they don’t actually have standards of efficacy to apply to their treatments. Strength training can have unique health benefits, and it doesn’t have to happen in a gym: Those who reported participation in any strength-promoting exercise (including gym workouts) averaged about 60 minutes a week and those who reported any own body weight exercises averaged 50 minutes a week. Participation in either gym workouts or own body weight exercises reduced the risk of early death by about 20%. Cancer-related deaths also decreased by 24-27%, but there was little evidence more was better.